"This is a recipe that always seems to be used at our family gatherings. Everyone loves it. It's also great to make ahead for busy days." Cook bacon in a large, deep skillet over medium-high heat until crisp, about 10 minutes. Drain bacon slices on a paper towel-lined plate and allow to cool; crumble. 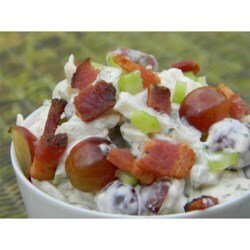 Mix cooked chicken, crumbled bacon, water chestnuts, celery, and red grapes in a large salad bowl. Whisk mayonnaise, dried parsley, lime juice, onion powder, ground ginger, Worcestershire sauce, salt, and black pepper together to make a smooth dressing. Pour dressing over chicken mixture and stir to coat. Cover the bowl and refrigerate until cold, at least 30 minutes. Kickin' chicken BLT salad, oh my! I loved this recipe! It has good texture and tastes great. I would definitely recommend it. My husband is very hard to cook for, but I decided to try some things that I like and he can eat something else. We both loved this recipe and he has already asked me to prepare it again. The best one I have tried. I added apple and omitted the bacon. Wonderful Ty! FANTABULOUS!!! Love this paired with the fresh broccoli salad by Nora. We also serve it with warmed whole grain pita wedges, which is complementary, and fun for the kiddos...thank you!